Nursery rhymes we grew up on are often acutely opposite to what happens in real life to animals on farms. 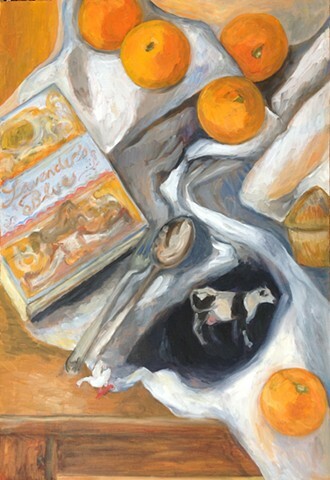 I combined nostalgic old metal farm animals with the Lavender Blue nursery rhyme book I had as a child, and a still life of oranges to make a whimsical comment about human food. The spoon and fork refer to our plates, the cow, hay bale and duck jumping off the table refer to humans insatialble need to eat animals.